By James W. Fatherree, M. Sc. Live rock is a key component of a reef aquarium and is used as the base that everything else is placed upon. 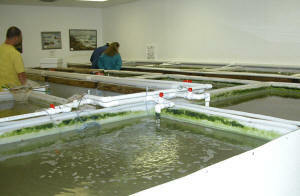 It is also being used by more and more folks to build structures and for decoration in non-reef aquariums too. It can also easily be the most expensive component as well, so it’s worth your time to learn as much about it as possible and how to take care of it. That being the case, I’ve provided some info and answers to a few commonly-asked questions concerning live rock and what to do with it once you get some. 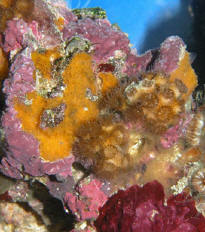 Here’s a piece of great looking Fiji rock that is cured, clean, and practically covered in beautiful coralline algae. Despite the fact that there are several different types, almost every piece of live rock is fundamentally the same thing. 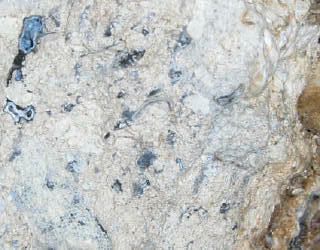 It's all limestone that has been collected from various areas in the sea where loose chunks of rubble can be picked up. In most cases this limestone rubble accumulates in areas naturally, but in others it has been specifically placed somewhere with the intentions of collecting it later. Aquacultured live rock sometimes has a few live corals on it, and other unique stuff, too. It doesn’t all look this good, of course, but this particular piece is awesome, being covered by corals, coralline algae, and sponges. When it is collected, these pieces of limestone have all sorts of organisms living on their surfaces and also within their porous interiors, and this is where the "live" part of "live rock" comes from. In general, you can expect a significant variety of microorganisms to populate any given piece of live rock and most will also have at least some coverage of coralline algae giving it a patchy purple, pink, and/or red appearance. A large part of what you’ll see for sale has those minimum inhabitants. On the other end of the spectrum, top-quality live rock has those organisms and may also carry a surprising variety of macroalgae, sponges, tunicates, bryozoans, worms, clams, snails, crabs, hermit crabs, shrimps, barnacles, brittle stars, sea stars, sea urchins, anemones, and soft and stony corals, etc. Lots of stuff! An incredible variety of creatures in the marine environment use the compound calcium carbonate to form whatever hard parts they may have. These parts could be anything from skeletons and broken pieces of them in the case of stony corals, to spiraling shells in the case of snails, to tests in the case of sea urchins, to spicules in the case of sponges, etc. Numerous sorts of algae use calcium carbonate to strengthen themselves or to produce tough rinds on surfaces as well and there are several types of plankton that use it to build minuscule containers to live in, too. The list is actually quite long. They do this by biologically combining calcium from the surrounding seawater with some carbon dioxide to form the minerals aragonite and calcite. 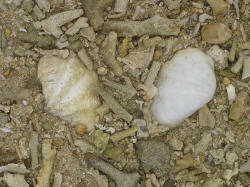 Some organisms use one of these calcium carbonate minerals, some use the other, and some use both. In addition to this biological production of calcium carbonate, when conditions are right it can also precipitate directly from seawater without any biological help. Conversely, it can also dissolve back into seawater at times if environmental parameters change in the other direction. Things like fluctuations in the local concentration of carbon dioxide and pH can cause this to happen. And, because the seafloor a dynamic environment, these sorts of back and forth reactions are occurring at essentially all times on some scale within various sediments and rocks. Here’s a great example of the hodgepodge of calcium carbonate materials that can end up forming live rock. Here we have tridacnid shells, coral fragments, sand, and more, all of which can eventually be “glued together” to form limestone. In a generalized setting, stony corals build calcium carbonate (aragonite) skeletons, which accumulate over the eons to form the foundational hard structure of a reef. Even when corals die these hard skeletons remain. However, the ever-constant erosive forces of wave activity can slowly break apart the reef structures formed by corals a little at a time during relatively calm periods and can also literally demolish large areas during major storms. Thus, there's more activity going on than just building up and up, as there is a never ending cycle of building and destroying. It is through this process that coral skeletons can be drastically transformed over time. As this is going on, a myriad of other organisms that live in the reef environment also produce a constant supply of calcium carbonate that gets added in with corals' skeletal material. Some of these additions may be as big as a Conch shell, or they may be tiny calcium carbonate particles produced when calcareous algae is ground up by predators and waves. Thus, we end up with a hodgepodge of calcium carbonate bits and pieces created by all sorts of living things, any of which can be called limestone once the creating organism is dead. Simultaneously, this whole mix of limestone bits and pieces is constantly being bound together by rinds formed by other calcareous algae. Water parameters change easily within the pore spaces and voids found between all these things and within them too. Thus, the non-biologic precipitation of even more calcium carbonate can form lots of limestone "glue" inside and in between them. But wait, changes in water parameters can also lead to the dissolution of it elsewhere. Any of these pieces can be slowly dissolved from the inside out and/or dissolved away completely. So again, there is a constant cycle going on as new and old pores, voids, rinds, and glues can be formed and dissolved, formed and dissolved, over and over and over. Regardless of the details, the net result is a hard reef structure made of a jumbled mix of biologically formed pieces and a lot of calcium carbonate rinds and glues that meld much of it together. It can have a highly variable amount of pore/void space within it and can be densely colonized by reef organisms, as well. These chunks of coral were broken away from a reef by a storm and are the sort of things that often end up being live rock - if they stay submerged for some time and aren’t actually blown out of the sea. Moving through time as the reef is broken up in some places, pieces of this limestone of variable size are freed. These pieces can be rolled around, broken up further and abraded by sand. They can be worked over by all sorts of biting, boring, and burrowing organisms and are colonized by various others too. And, as mentioned before, they can also be affected by ever-changing water chemistry. The net result is that in certain environments very diverse looking broken away pieces of limestone can end up at rest on the surface. Such a piece may have had some life on it when it broke away or may be colonized by organisms afterwards or both. Live rock can also be produced by taking limestone mined from land, dumping it in the ocean in an appropriate location and waiting for it to become colonized. This is called live rock aquaculture, and several businesses that are doing it use quarried limestone pieces from areas that were submerged in the past. Even though they’re just plain limestone rocks in a pit now, that rock was formed by marine organisms and processes in the geologic past and stranded on dry land by changes in sea level or changes in the earths surface. Once collected, these pieces of ancient seafloor are carried out on boats and barges to predetermined areas and dumped to form small man-made reef structures. Eventually they are colonized by the same sorts of things that would be found living in and on any other piece of limestone in a natural reef and can be collected and sold. Live rock has been collected in a number of places but most of it comes from islands in the South Pacific. The majority originates from island nations like Fiji, Tonga, and Samoa. There are two primary reasons for this. First, the collection of live rock in U.S. waters was banned by the government in 1997. Second, it's cheap. Island workers will work for much less than U.S. workers and since airplanes fly to the islands loaded with supplies and fly back relatively empty, air freight out of the islands is reasonably priced. While the government may have banned the collection of "wild" live rock, they decided to allow businesses to make their own and collect it. So, aquacultured live rock, which is produced almost exclusively in the Gulf of Mexico and the Florida Keys has made its way into the market with all of this Pacific rock. The result is a variety of live rock types from a variety of areas to choose from. This is one I can't answer for you, as there certainly is no single "perfect" type, and it's hard to even proclaim that one is better than another. However, I can help you make your own decisions. The key is to think ahead about what you want your aquarium to look like and how much you want to spend. There are different types of aquacultured live rock, some better than others, and in general it typically has the most live stuff on it. 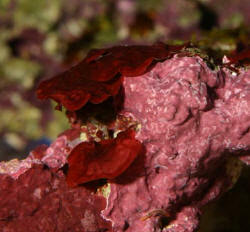 In fact, the best rock is actually completely covered by coralline algae, encrusting sponges, and corals, etc. This can be great looking, but at the same time, if you are building a big rock structure/wall you will inevitably end up having to stack many pieces in such a way that much of what's on it will be squished and killed. As a general rule, aquacultured rock is dense and has bouldery, less interesting shapes. Here you can see the difference in the porosity of some typical Pacific live rock (top) and some Florida aquacultured live rock (bottom). The Pacific rock is much lighter for its size due to all the pore spaces, while the Florida rock is relatively dense and heavy. On the other had, most wild Pacific rock has less life on it because of the greater time spent in shipping and handling, but what is there is tough! Wild collected Indo-pacific rock is usually less dense than aquacultured rock and has some especially interesting shapes, too. So, it might not be “alive enough” for you to build your whole structure with, but some pieces are so neat looking that they make great additions anyway. 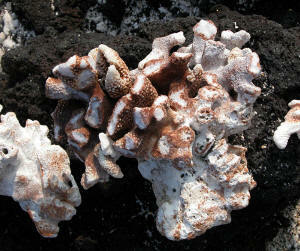 There are other sorts of more unusual "specialty" live rock, such as “Tonga branch” rock. It looks just like the name sounds, as it is made of broken up pieces of staghorn coral that have died, been physically and chemically altered, and then overgrown by coralline algae. Thus, it has a very distinctive form and doesn’t really look much like a rock at all. You could, of course, use just Tonga branch to build your whole reef structure if you so desire, but many hobbyists prefer to only use some pieces here and there if they use any at all. In such cases some other type of live rock is used to make the base structure. Each type can be used to achieve a very different look. Aside from that, you need to keep in mind that none of it is cheap, and you will have to compromise between good looks and function versus using the least amount of live rock to do it. You have to buy the stuff by the pound, so fewer pounds means more money left in your wallet (or purse). Thus, there's more to think about than just looks. Most Pacific rock is relatively porous and lightweight and has lots of open shapes, especially compared to aquacultured rock, so fewer pounds are needed to fill a tank. In fact, if you arrange it right, just a few big pieces can really fill a lot of space and look great. On the other hand, since aquacultured rock tends to be less porous and can be relatively heavy, it takes more pounds to fill the same amount of space. Keep in mind that aquacultured rock typically has much more life on it! Since the number of pounds needed can be significantly different based on which type you choose, the price per pound may be less important than the total cost of your choice. Some businesses keep lots of rock stocked in their own systems long enough for it to cure before you get it. In these cases, you might be able to add it to your aquarium immediately, although it may still be prudent to hold it in quarantine for several days just to make sure it is okay. Sniffing it can help you decide. In case you aren't thoroughly confused, "base rock" is often available too. 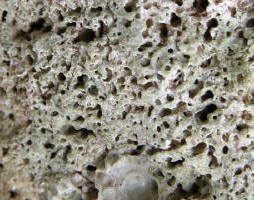 Typically base rock is also limestone rubble, but it generally has next to nothing or even nothing living on it, with the possible exception of some microorganisms. It may even be sold dry. Base rock is much cheaper than other rock and using it to build the base of your live rock structure is a great way to cut costs. Just buy a few pieces and then cover them over with quality live rock. Many aquarists prefer to get the "best of all worlds" by mixing any or all of the types of rock. A foundation of base rock, a few pieces of top-quality aquacultured rock for lots of life, and pacific rock and/or branch-type rock on top for looks. You have to decide, but you certainly shouldn't feel like you have to pick just one type. How do you take care of it once you have it? When you get fresh live rock you’ll need to keep a watchful eye on the attached organisms, such as this clam and encrusting sponge, from start to finish through the curing process. If they should die, remove them manually immediately. Once live rock is collected, there is always at least some die-off of the life that is on/in it, and sometimes there's a lot. If you happen to get some rock that has been collected very recently, you'll have to deal with this die-off yourself. On the other hand, if the rock has been sitting in a well-maintained dealer's system for a while you may not need to do anything but put it in your aquarium. Regardless, after it is in your tank, you'll still need to do a few things to keep it looking its best. So, let's keep going. 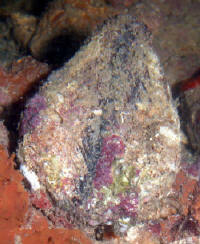 Many sponges and other organisms found on live rock cannot tolerate shipping very well because they are exposed to air and/or unacceptable temperatures in the process. 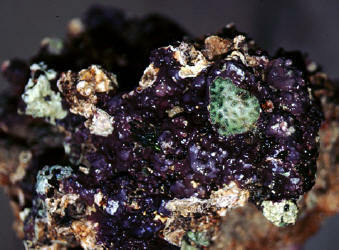 Thus, many things on live rock will die and rot away within a few days of being collected and transported. There may also be numerous things living inside the rock that die and decay, too. Such decay, whether you can actually see it or not, produces ammonia in aquariums and ammonia is deadly. It takes some time for all this to happen and for the decay process to stop, thus you typically can't just buy a bunch of live rock and add it to a stocked aquarium or add livestock to an aquarium you have just added fresh live rock to. So, what do you do? You "cure" the rock. Typically, this means keeping the live rock quarantined in a tank without other livestock, and maintaining good water quality in the tank for at least a couple of weeks. Even longer is better if you have the patience. If you’ll maintain an adequate concentration of calcium in the water, acceptable alkalinity levels, and good water quality, you can expect colorful coralline algae like this to slowly grow over practically every inch of your live rock. Use a good skimmer on the container and test for ammonia, too. It is also very helpful to employ a good biological filter that already has a full complement of bacteria if possible. Something like a bio-wheel filter or canister filter with bio-media will usually be fine for small batches of rock, but I've used big fluidized bed filters, and even trickle filters for big lots of rock. Do note that these should already be established though. If ammonia shows up, do a large enough water change to get it as close to zero as possible. You need to do this because if you let ammonia concentrations get too high it will kill everything else on the rock that isn't already dying, which will make the curing process last even longer and very likely leave you with some base rock that is devoid of anything but bacteria. The best thing to do is keep up the water changes as needed until no more ammonia shows up. Of course, this is unfortunately the most expensive and time-consuming way too, but it also helps maintain calcium, alkalinity and general good water quality. You aren't necessarily done when ammonia stays at zero, though. This is because there are almost certainly some bacteria living in the rock that can consume ammonia. So, if the bacterial population increases in size until it can remove ammonia as fast as it is produced, you may get a zero reading before the rock is really finished with its die-off period. Thus, your nose is often the best way to determine if you are really done or not. When ammonia stays at zero, start giving some individual pieces a good going-over with your sniffer every few days and see if they stink. Fully cured rock has a clean "oceany" smell. If they stink, then things are still decaying - even if your ammonia test kit says things are fine. Get it? So, when ammonia is at zero and things don't stink, you really are done. If you manage to get to this point in less than a couple of weeks I suggest you wait it out a little longer anyway just to be safe. Then, after the waiting has gone on for what seems like an eternity, you will finally be ready to use your cured live rock. Finally! Now, with all that covered, you should also keep in mind that if a dealer has had the live rock in their own well-maintained system for a while, the whole curing process may have already been taken care of for you. You may get to skip it all. Yippee! Thus, you may be able to pick up the rock, take it home, and add it to your aquarium immediately after acclimation. If you think this is the case, use your nose again first and see how the pieces smell. If they have been in the dealer's system for at least a couple of weeks and there's no stinky odor, it should be okay to add it to your aquarium. I do treat the pieces just like any other livestock and slowly acclimate them to the new water conditions first, though. Of course, each situation can be a little different, so in the end you have to make your own judgment call when it comes to curing or not curing live rock. But, as is often the case, if you have any doubts it is best to show a little patience and play it safe. Other than getting it in the tank, you’ll want to use calcium additions to keep the calcareous coralline algae growing, and to help it spread over areas of the live rock that aren't covered already. Like corals and other calcium carbonate-precipitating organisms, this requires an adequate concentration of calcium in the water, acceptable alkalinity, and good water quality, too. If you'll do all this, given enough time your live rock can become completely encrusted with living things, and will look absolutely beautiful.